Lady Melody Rose has breezed through training and is a Canine Good Citizen. 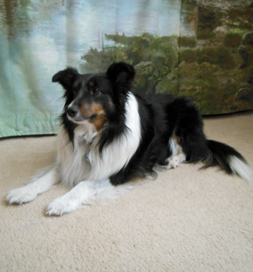 Many of her dogs had been Australian Shepherds, so when she decided to adopt another, she opted for a Shetland Sheepdog (Sheltie) she saw on Petfinder. The dog had been roaming the streets of Bakersfield, CA, when she was picked up by an animal control agency that already had about 700 dogs and was told they had to move. Animal welfare groups in the region offered to help. One of these was Pet Matchmaker Rescue, which took in the Sheltie. She “knows how to work the cute, including doing the heart-melting ‘hamster paws.’ but don’t let that fool you; she is one clever girl in a small package.” Knowing how clever the dog was, Cara began testing her with simple commands, but got nowhere. So the dog started her training in English (as a second language). She breezed through several classes and is now registered with the AKC Purebred Alternative Listing (for purebred dogs without papers) as Lady Melody Rose, CGC (Canine Good Citizen).